Västra Hamnen ek. förening – Have it all; är plattformen som gör Västra Hamnen till den självklara platsen där alla vill bo, utveckla affärsmöjligheter eller bara vara. We love Fridays. And breakfast. And our community. Combine the three of them and you get the World’s Best Morning. Today’s youth are, famously, the leaders of tomorrow. However, it doesn’t stop there. At Skanör Falsterbo Montessoriskola, they have since long realized that there’s much to gain from treating young people as potential future colleagues (rather than, as it were, “young people”). This is why everyone at the school is regarded as a coworker – no matter if you happen to be eight years old or a full-grown adult. Young people’s views on society will shape their future demands. This will affect the expectations they have on their future employment and employers. How our youth view the ethical values of a workplace, or the importance of collegial cooperation, or even the qualities of a good leader, is crucial when making decisions about their future. 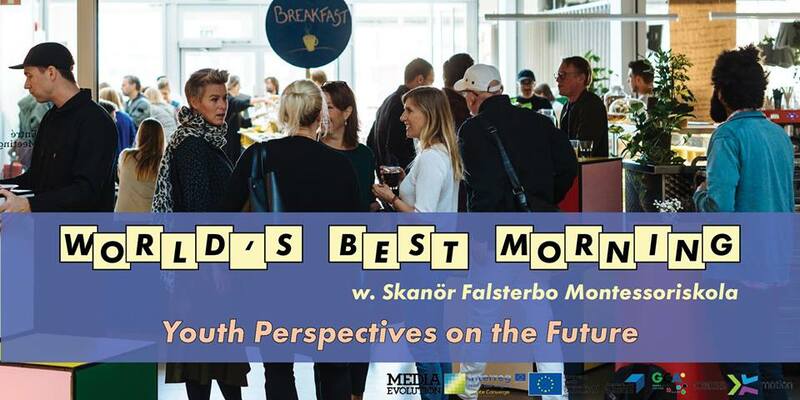 During this World’s Best Morning, you will get the rare opportunity to spend an hour with a group of determined teenagers who are all eager to share their (and their younger coworkers’) thoughts on the future. They are, most definitely, as curious about it as you are! FOR: All members of Media Evolution and friends of Skanör Falsterbo Montessori. Få alla nyheter direkt och missa aldrig något event!